Earlier in 2009, Nandan Nilekani, one of the founders of Infosys Technologies was pulled out from the company for a very prestigious project that had been started to equip every Indian with a biometric Unique Identification Card. 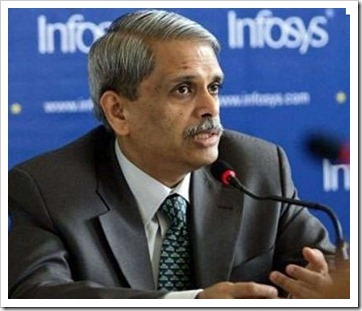 Now, it is Infosys’ executive co-chairman Kris Gopalakrishnan, who will take charge of government committee meant to carry on cloud computing services in India. Kris Gopalakrishnan is the Chairman of the IIT Bangalore and Vice Chairman of the Board for Information Technology Education Standards (BITES) set up by the Government of Karnataka. According to press release, this cloud computing committee has been formed to promote cloud computing services in and from the country. With rapid cloud adoption across all industries, the panel will see how cloud computing services can be used in areas like healthcare, education, e-governance and banking etc. There is no doubt that India will play prominent role in the growth of cloud computing in the coming years. According to a Gartner survey, Indian companies expect to adopt new cloud services much faster than originally anticipated, with two-thirds of CIOs expecting the majority of IT to be running in the cloud within the next four years. In past news, IDC, a research firm has forecasted an impressive future for cloud computing in India. IDC reported that the Indian cloud computing market would grow at a CAGR of 40 percent by 2014, and to become a $3 billion dollar market by 2015. Cloud computing services enable companies of all sizes to enter the market quicker and more easily. It has been seen as a mean to generate country’s competitiveness at the global level. Based on pay-per-use model, cloud computing as well as benefit economically. However, country like India needs focus on basic Infrastructure facilities like lack of Internet access and stable electricity in some areas. It is interesting to note that only Infosys’ directors are being considered for the top government IT projects. I think more senior executives from diverse background need to come on board such initiatives as well. What are your views on appointment of Gopalakrishnan as head of cloud computing committee? Mandira Srivastava is freelance writer and interested in reading, writing and playing carrom.